This pattern is available in print for $8.00. Enjoy knitting easy stockinette stitch with a pop of ribbed cable in this easy to stitch puff sleeved sweater that’s worked from the bottom up seamlessly. 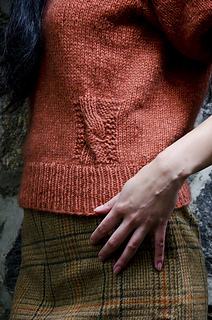 I worked this sweater in Zealana Yarns Heron, a wonderfully soft and supple worsted weight yarn. The sleeves are worked flat from the shoulders out with dramatic decreases for a puff sleeve just as roomy and comfortable as the rest of the sweater! Bust: 38 (42, 46, 50) in.